Is Minicontac the plating device? 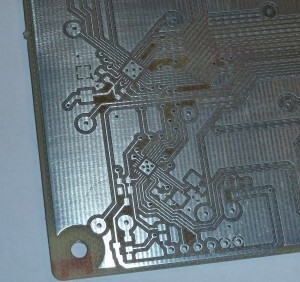 Apparently, it does a great job, and so does the milling machine, the result looks very nice and clean! The MiniContac II is a electrochemical plating system yes. The milling machine is able to do 4 mil details, but we only have tools for 8 mil, since the smaller ones is too expensive and wears out really fast. 8 mil is safe for most PCB board houses, and 4 mil may not be, so I imagine there’s no reason to push the machine to its limit for prototyping if you won’t be able to make actual boards (economically) with the same accuracy. Also, I imagine milling it to 4 mil accuracy would take 2-4 times longer? 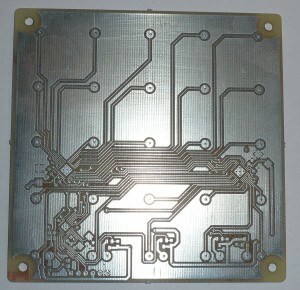 Just out of curiosity, how long did it take it to mill out the LED cube PCB pictured here? Do you remember the spindle RPM and the feed rate values? Thanks! Yep, no real need to go to 4 mils, since 8 mils is small enough for the smallest component we can mount by hand anyway. Milling of the board took around 30 mins, and chemical trough-hole plating 2 hours. The spindle runs at 40.000 or 60.000 RPM when milling small features, i don’t recall which i used. I have no idea about the feedrate, it’s all standard settings in the software for the machine. Ah, 40,000 RPM – that’s where the key to that awesome quality is! I am trying to squeeze every last bit of speed from my CNC router’s spindle but I have no hope of ever exceeding 10,000 RPMs – my guess is that’s what makes the edges of the traces so jagged. Is it pressure air turbine or a BLDC motor, do you know? Thanks again for the photos – I may never be able to achieve the quality on my equipment but it’s a great reminder of what can be done, so I’ll just keep trying. Yep. It’s the high RPM that makes it possible to do such fine milling. The motor is a BLDC.